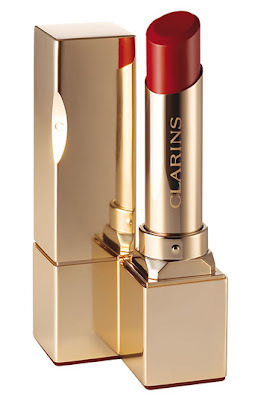 If you're in the market for a long lasting lipstick with the finish and look of a sheer stain, you will love Clarins Rouge Prodige True Color and Shine lipstick. This is easily one of Clarins' best cosmetic offerings in recent years. I just could not stop wearing these! They are extremly moisturizing, while never having a sticky or heavy feel. The lipstick features a wide slant tip for quick and precise application. The texture is creamy smooth with just a touch of texture to give it the long wear. The finish is semi-sheer with a beautiful color payoff and just the right amount of shine. The long lasting claims are definately true. For a finish like this, it's really amazing how the color manages to really cling to the lips throughout most of the day. I would say I only touched up on average, 1x day. The tube is lovely and gold metal, (yet lightweight) with a beautiful shape and etching on the side which fits fingers perfectly (shown above).